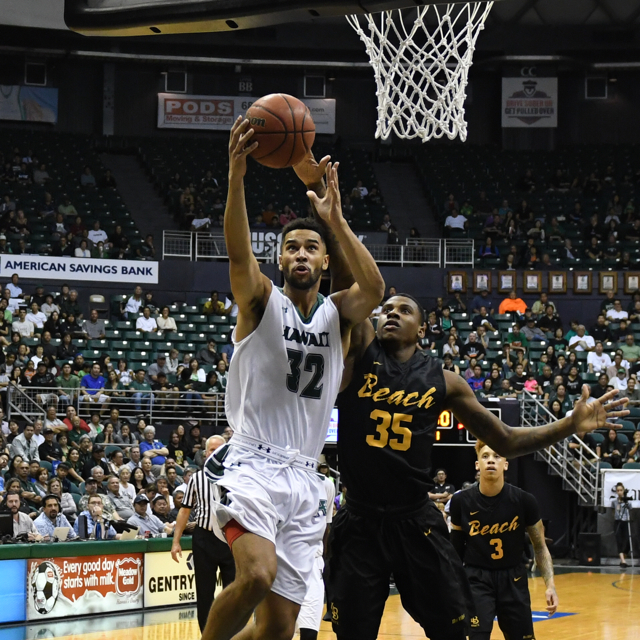 The University of Hawai’i basketball team made a resilient chase but could never catch Long Beach State in an 84-75 road loss on Saturday afternoon at Walter Pyramid in Long Beach, Calif. The Warriors stayed close for most of the second half before the 49ers pulled away in the closing minutes. Hawai’i finished the regular-season with a 14-15 overall record, and in fifth place in the Big West Conference at 8-8. Long Beach State improved to 14-18 and 9-7 after splitting the regular-season series with the Warriors. The same teams will meet again in the quarterfinals of the Big West Tournament on March 9 at the Honda Center in Anaheim, Calif. Hawai’i will be the No. 5 seed, and Long Beach is No. 4. Noah Allen led the Warriors with 21 points and seven rebounds. Sheriff Drammeh added 12 points and five assists, and Gibson Johnson contributed 10 points and five rebounds while playing with an illness. Among the reserves, Leland Green had 11 points and seven rebounds, and Matthew Owies scored eight. Starting forward Jack Purchase fell to the court with an ankle injury with 11:46 remaining in the first half, and was assisted to the sidelines. He did not return, and finished with three points in eight minutes. Freshman Zigmars Raimo started the second half in Purchase’s usual spot at power forward. There were seven lead changes in the first half, and the Warriors led by as many as six points early in the game. Hawai’i’s last lead was at 31-28 after Drammeh drained a 3-pointer with 7:47 remaining in the first half. The 49ers responded with an 11-0 run to take a 39-31 lead with 5:09 remaining in the first half, and they eventually took a 45-39 advantage at intermission. The 49ers shot 62.5 percent (20 for 32) from the field in the first half, with 6-foot-7 forward Temidayo Yussuf scoring 13 in the first half on 6-for-6 shooting. Yussuf finished with a game-high 23 points on 9-for-9 shooting. Noah Blackwell added 17 points, including 5-for-9 shooting from 3-point range, and Roschon Prince had a double-double of 10 points and 10 rebounds for Long Beach. The 49ers maintained the lead the entire second half, but could never pull away from the Warriors. Hawai’i got as close as 65-64 with 6:44 remaining on a jumper by Drammeh. Long Beach answered immediately with a jumper by Evan Payne on the ensuing possession to ignite a 7-0 run that increased the 49ers’ lead to 72-64 with 4:22 left. The 49ers finiahed the game with a .542 field goal percentage, and out-rebounded the Warriors, 35-28. Hawai’i finished with a .464 field goal percentage, including .579 (11 for 19) from 3-point range, but was just 12 for 21 (.571) on free throws. UC Irvine won the Big West Conference regular-season championship and earned the No. 1 seed for the conference tournament with a 79-49 win over UC Davis on Saturday. Now….Ganot recruit another Fleming…Bobbitt…Valdes…Janis…Q…And Jovanovich…Now I hope Ganot and staff kept in touch with 3 star recruits..Team..This year..I believe Warriors will win BWC tournament again….They are the most disciplined and determined team!! Those would be good players to reincarnate, but there is one problem. He didn’t recruit those guys. They were hold overs from Gib/Akana/Benji era. People have to realize that Noah Allen is a special find for Hawaii, but everything was perfect for Hawaii to get him! Everyone keeps talking about recruiting these high level guys to impact our program right now! Why, is our development program that bad, as to where they can’t get a kid that’s just good and make him great? In the post interview after senior night, Kawika Hallums brought up UH should try to get Jessiya Villa. Johnny White kind of rolled his eyes! There are a lot of people that may agree with White, and they are crazy. 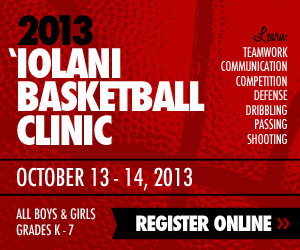 This kid grew up playing on the East Coast where he was player of the year as a junior, then came to Hawaii and smashed the competition at the Iolani Classic, played half of every game of the OIA season leading Kahuku to an undefeated regular season, lead every game he played in the post season in scoring (except Kalaheo, when they won by 40 and he again played a half), won OIA player of the Year, is being recruited by teams like Stanford according to the broadcasters, and isn’t good enough for UH in White’s eyes! Come on man, there are articles online about Gib offering this kid when he was in middle school! This is the same Gib that recruited all those players that you just mentioned! He was smart enough to see the Villa was good enough to be a Warrior back then! To ease some people on this two year mission thing! These guys can workout from 5:30 – 7:30 am. BYU just beat #1 at the time Gonzaga last week using retuned missionaries.